Union Jack’s: We’ll Be Back! Paul and I had been away for a while this winter and came back to discover that there was a new restaurant to visit! This is a very good thing, because we are always to looking for new local places to try and recommend! Union Jack’s is located adjacent to the Annapolis Towne Centre in the former location of Sharkey’s. It is a British themed sports bar/ restaurant with deep red walls, accents in black, two bars, a stone patio floor, and lots of flags and framed posters decorating the space. There are high and low top tables, and booths in this roomy location, as well as six pool tables for your enjoyment. As with any sports bar, there is no shortage of all sizes of TV screens. The most noticeable one is a huge 14-foot projection screen located in front of a stage that is otherwise used for live music on weekends. Our visit to Union Jack’s was for lunch on a weekday and it was not crowded. Our friendly and helpful server, Jeff told us that business has been best on the weekends so far. We ordered iced teas and looked over a very interesting menu. I say this because there were several items that I would have liked to try. For instance, the Carribean jerk chicken with fiji apple slaw and mango-pineapple chutney on a Challah roll or the blackened fish sandwich. Paul ordered an appetizer consisting of two baked pretzel rods. They were hot, soft, and salted, with a side of spicy honey mustard dipping sauce. He was very pleased with his choice! For his meal, Paul selected the Burgess Park pizza. The menu lists four pizzas with certain toppings, although you may also choose toppings and create your own pizza. It is baked on 12” house-made dough, and gluten free crust is also offered. 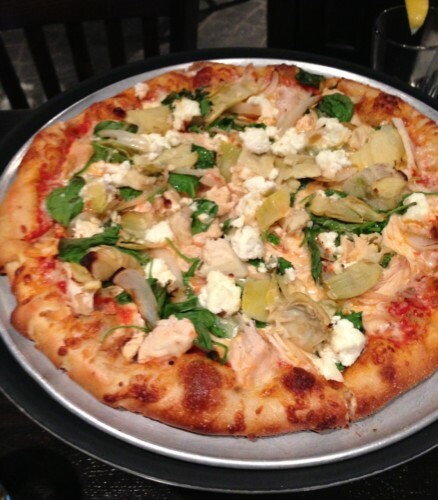 The Burgess Park variety came with hand-pulled smoked chicken, baby spinach, onion, artichoke heart, parmesan, ricotta and mozzarella. Paul ate only half of the pizza, probably because of the pretzel appetizer! He was very happy with it, but will ask to leave off the ricotta next time. We did ask for a box to go. I decided to order the Vegan burger on flatbread. 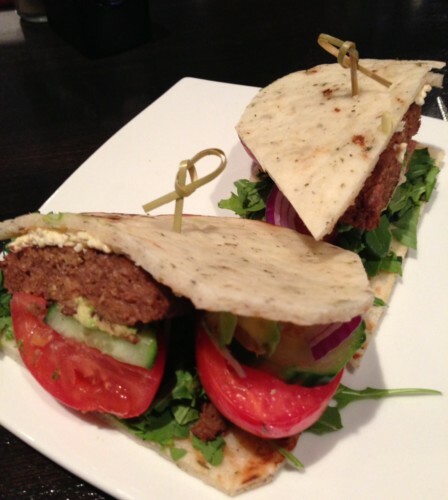 It was made with 6 oz Match premium vegan ground beef, baby arugula, roasted tomato, cucumber, red union, avocado, and Daiya cheese on herbed flatbread. I absolutely loved this sandwich! The burger itself was delicious, but even more pleasing was the generous amount of ingredients on the burger. I needed to use a knife and fork! Instead of fries, for a small additional charge I asked for a side salad. It may just be me, but I’m very interested in how a restaurant chooses to serve a side salad. Some of them are pretty lame, however Union Jack’s hit a home run! The salad consisted of a good-sized amount of mixed greens, cucumber, tomato, shaved carrots, and onions. I selected the house champagne vinaigrette dressing on the side. We loved the service and the food and certainly plan to return soon! In fact, I enjoyed two pieces of the leftover pizza for dinner that night! The cost for our meal was $31.27 plus tip, including a $5 coupon from a local magazine.